West Nussa Tenggara is a beautiful tourist destination in Indonesia that worth to be visited. Today we want to emphasize the beautiful nature of the Province. We would like to present you the top 7 tourist destinations in West Nusa Tenggara including the Batu Bolong Beach with the huge rock with hole, the beautiful and quiet The Kuta Beach, the Gili Air, Gili Meno and Gili Trawangan of Lombok, the surfer paradise Hu’u Coast, the famous Senggigi beach with scuba diving opportunities, the Rinjani Volcano with the crater lake and the notorious Tambora Volcano. 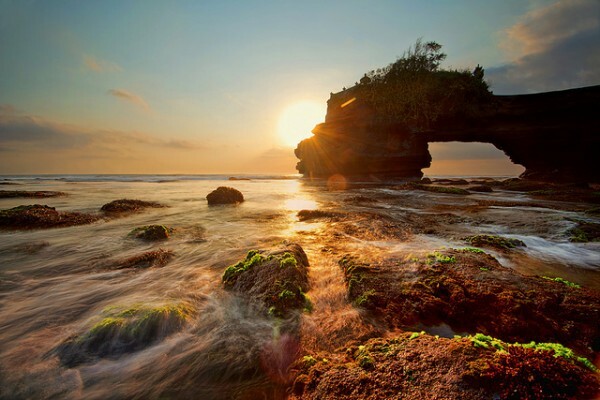 The Batu Bolong Beach in West Nusa Tenggara at just 9 miles from the city center of Mataram and has a huge rock in the middle with a huge hole. On the top of the cliff is a Hindu temple, which is oriented to Lombok and Bali and more importantly to the Agung volcano. After the sunbathing, relaxation and entertainment is worth to wait for the sunset on this beautiful beach, because it is hardly possible to imagine something more beautiful than the sun disappearing behind the Agung volcano. 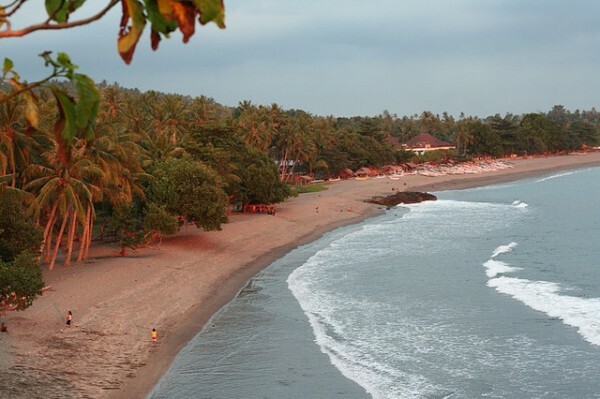 The Kuta Beach, also known as the Putri Nyale beach is one of the most beautiful and quiet tourist destinations in West Nusa Tenggara on the southern coastline of Lombok. Between Kuta and the Tanjung Aan (Aan Cape) the waves of the Indian Ocean are meeting the pure white sand of the beach on five kilometers. Kuta is particularly suitable for bathing and swimming. Gili means island in the Sasak language. You can find the three small islands at the north-western coast of Lombok. The islands are surrounded by coral reefs and clear water. Gili Air is the closest to the coast of Lombok, you can get there in 10-15 minutes by sailboat from the Bangsal harbor. The Hu’u Coast in the Dompu Prefecture of West Nusa Tenggara is one of the most famous surfer paradises in Indonesia. 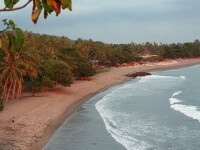 Its white sandy beache lies at 37 km from the town of Dompu. In July is the place of an international competition. The coastline is considered to be one of the best surf places in the world. The Senggigi beach in the north of Bangsal is one of the most picturesque and popular tourist destinations on the island of Lombok. 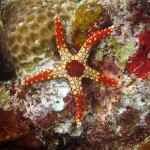 There you have great accomodation options besides the scuba diving opportunities. The Rinjani Volcano is a 3726 meter-high active volcano and one of highest mountains in Indonesia. In of the huge volcanic caldera between steep walls lies the crescent-shaped Segara Anak crater lake. 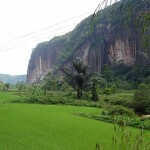 The mountain is a very popular tourist destination in West Nusa Tenggara. 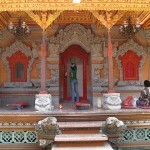 Sembalun Bumkbung and Sembalun Lawang are traditional Sasak villages at the foothills of the Rinjani. 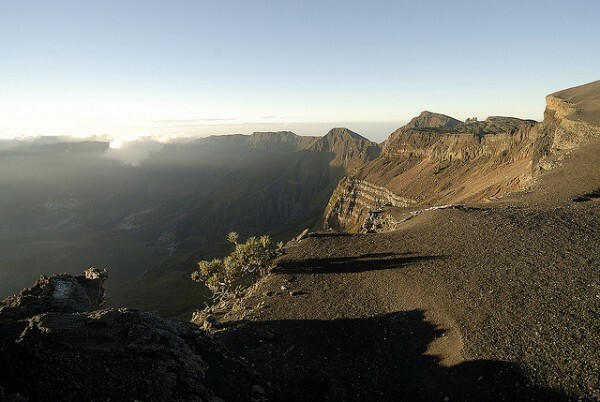 The Tambora volcano on the island of Sumbawa is no longer active, but the 2820-meter high mountain is famous for the outbreak between 5-15 April, 1815. The falling stone pieces, the hot gases and spilling lava killed more than 12 thousand people. Due to starvation after the eruption an additional 44 thousand people died. On the top of the mountain, in the giant caldera lare two lakes of different colors. From the edge of the crater you can have a breathtaking view of the rest of the island, of Lombok and the Rinjani Volcano standing out from the sea.